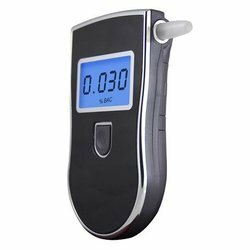 Our product range includes a wide range of alcohol breath analyser. For security reasons, driving after consuming alcohol is banned in all the countries. It poses measure security threat to citizens. Reporting to work immediately after consumption of alcohol is also not allowed. This equipment helps to measure alcohol content by analyzing the breath. In India permissible level of Blood Alcohol Content is up to 0.3mg/L. It can be used by: 1.) Police 2.) Security Staff of offices, industries, BPO’s 3.) Travel & Tour operators, Taxi Services, Rental car services Etc. System provides battery backup for about 200 operations in a single charge.